The iPhone, since its first release on June 29, 2007, has brought us a lot of fun and changed our livies in many aspects. iPhone has lots of functions, from universal text messaging, email, to visual voicemail, web browsing, Wi-Fi and 3G connectivity, etc. And most importantly, it's also a portable media player, which supports music, audiobook, podcast, application and video. Being the most popular handset, iPhone brings people improved digital life as well as enhanced entertainment. * The hyper threading technology and multi-core CPU tech applied will help users to free rip DVD to iPhone in fast speed and no quality loss on Mac (macOS Mojave included). Free download the free DVD Ripper iPhone for Mac (Windows version is also available), launch it and click "DVD Disc" to add DVD from DVD drive. Or you can click "DVD path" to import DVD from DVD folder saved on your computer. It accepts any types of DVDs, as well as DVD video folder (VIDEO_TS) and ISO image files. Then the free DVD to iPhone ripper will start to identify the correct title of DVD movies/TV shows automatically. The disc analyzing process finishes instantly most of the time, but it may take seconds for tough DVDs. To free rip DVDs to iPhone XS/XS Max/XR, 8/8 Plus, iPhone X, iPhone 7s/Plus, iPhone 7/Plus, iPhone 6S/Plus or earlier models, select the one of the iPhone supported formats from the list. MP4, MOV and M4V can all be played on your iPhone. If you are going to add the ripped DVD video to iPhone via iTunes syncing, you can also choose an option from the iTunes Video list. Specify an output folder on your computer to save the ripped DVD video files. Click "Browse" button to choose the path where you want to save the output files in. After finish the above steps, click "RUN" to start to rip DVD movies to iPhone XS/XS Max/XR/8 Plus/8/X. You can view the conversion progress and are able to cancel the converting process at anytime. You can take a break or have a cup of coffee, it normall takes a quater to finish the DVD to iPhone free ripping. Note 1: If you are planning to rip DVDs to iPhone XS/XS Max/XR/X or iPhone 8 with tough encyrptions, for example, those DVD movies from Disney, you're suggested to check the box of Safe Mode. This is an advanced function built-in the free DVD ripper iPhone that has been proven to solve most protected DVD ripping problems. Note 2: To ensure high output quality as possbile, check the box of High Quality Engine. Note 3: Considering that you're going to rip DVD to iPhone for free, and also that a DVD movie come large in size, you may want an output DVD video with smallest size as possible (also good quality). There are some tiips for this: you can cut unneccessary parts of the DVD movies, select MP4 as the output format (well-balanced between quality and size), adjust the video settings, and remove extras in the DVD. Source DVD info: A TV show DVD named NCIS. The correct main title 7 takes up 1.6GB. Computer info: An iMac running on OS X Yosemite, with 2.7GHz Intel Core i5. MacX DVD Ripper Mac Free Edition is totally free which specializes in ripping DVDs for free on Mac OS to MP4, MOV, FLV, MPEG, iTunes. 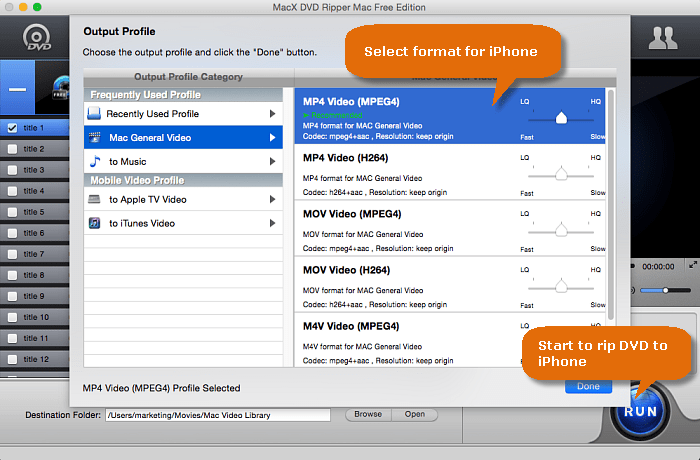 You can easily rip DVD to MP4/MOV for iPhone, iPad, Apple TV within a few clicks. It offers powerful yet easy-to-use functions, excellent video/audio quality, fast ripping speed, small size that makes it fast to launch. But if users need more output formats, devices, functions, try the advanced version MacX DVD Ripper Pro. * 5 minute ripping guaranteed! 5x faster than others. * 200 more output video and audio formats. * 350+ profiles for iPhone, iPad, Android, Windows, Google devices. * Supports any homemade, protected dvds, newly-released DVD movies, Japanese disc more. * Four ripping modes, not only rip dvd to iPhone or mobiles, but also 1:1 copy DVDs for storage. 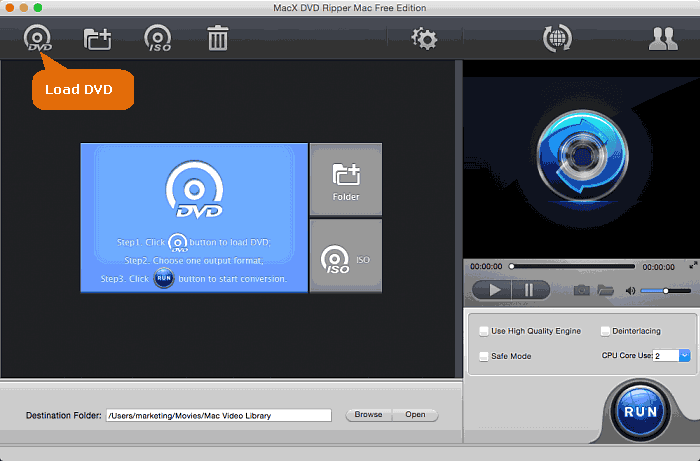 MacX DVD Ripper Pro, the top-rated best DVD ripping software for Mac, not only empowers you to convert DVD to MP4, MOV, AVI, FLV, WMV and 350+ preset profiles, but also 1:1 copy DVD to ISO images, MKV, MPEG2 files fast, up to 36X real time converting speed. After you ripped DVD to iPone compatible video formats, it doesn't mean that you can freely watch the DVD movies on your iPhone XS/XS Max/XR/X/8/7/7 Plus/6S/SE. There is one more step to achieve it - transferring videos to iPhone from Mac. MacX MediaTrans is the ultimate tool which helps you to do so. The powerful iPhone transfer is proficient in transferring movies from Mac to iPhone, regardless of the video formats incompatible issue. It automatically converts videos to iPhone iPad video format during the transferring process. iPhone 8 is coming on the road! Wanna rip DVD to iPhone 8 for enjoying movies on the go? This article will show you how to rip and convert DVD to iPhone 8 without sacrificing any quality. Wanna rip DVD to iPhone 7 for free enjoyment? 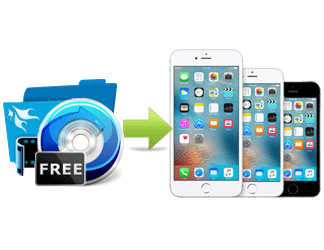 This guidance offers you the easiest solution to rip and convert DVD to iPhone 7 (Plus) as well as iPhone 6S/6 with no loss of image quality. Always get hassled when transferring videos from Mac to iPhone via iTunes? Take it easy! You will be kept out of trouble if you transfer video from Mac to iPhone without iTunes. Here a simple solution is provided.